Very shortly, the alarm clocks will be turned back on. Your lunch box will be packed, your teacher bag will sit by the front door, and an outfit that is stylish (yet comfortable) will be picked out for your first day back from winter break. When you enter your classroom, you’ll pause at the door and take it all in for a quick second. It’s good to be back. But how do you and your students transition back into “school mode?” There is not a “one size fits all” approach to having a great first day back from winter break. Some teachers like to dive right back into things as though no one had a day off at all. Other teachers take their time easing back into a routine over the next few days. While neither approach is incorrect, I do think it is important to reflect and create a plan for how you will approach that first day back from break. 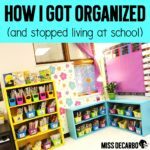 In this post, I’ll share my own teacher tips and what I do on the first day back from winter break. If we’re realistic, we can’t pretend that our students did not have to get up early for the past two weeks. We can’t pretend that they didn’t stay up extra late, eat extra sugary treats, and share very special time and memories with their families. We can’t assume that EVERY student listened to us when we reminded them to read every day over break. We can’t assume they had a structured daily schedule as they do when they are in our classrooms. We can acknowledge that the first day back from break is critical in setting the tone for the remainder of our year together. In some ways, it is as important as THE first day of school. It can be a smooth and happy transition back to school for my kids. Or, it can be one of frustration and rushed chaos. 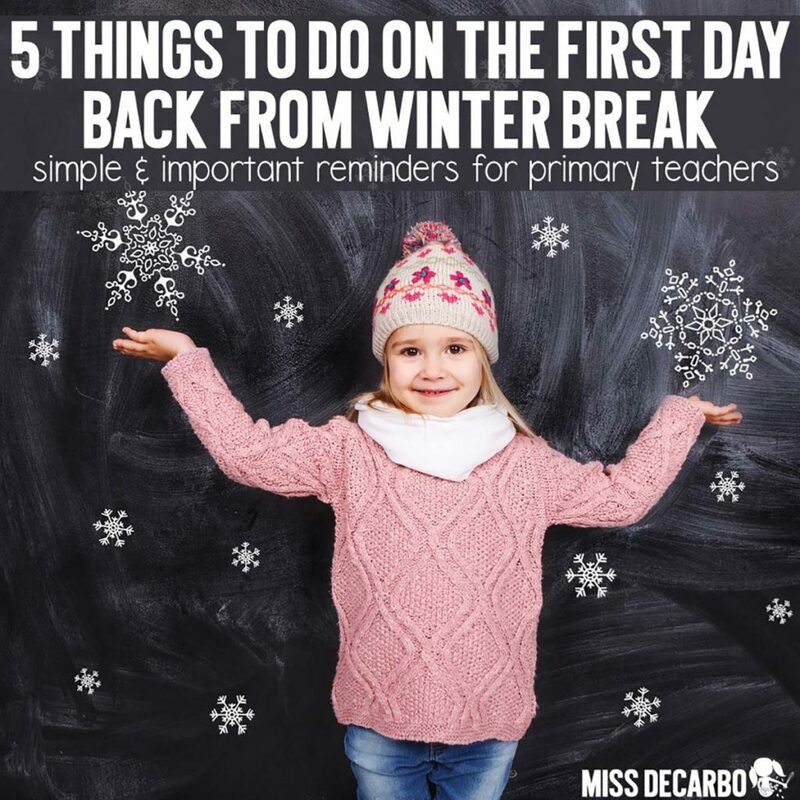 Over my years of teaching, I have realized there are five important things I do to make our transition back to school a smooth and happy one on that first day back from winter break. 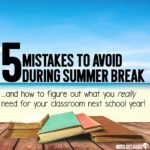 In this post, I’ll share those 5 teacher tips for returning from winter break with you. Although these five tips are simple and straight forward, they are important reminders for primary teachers. I realize these ideas sound so basic and simple. After all, your students can do so many skills, so why not have them start reviewing and jump right back into the standards? For me, it’s vital that I eliminate any stress, frustration, or worry during the morning we get back from break – just as I would do during that first day of school in August. 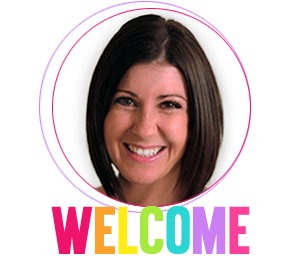 It’s all about feeling welcomed into our classroom again, being eager to be back at school, and being happy and enthusiastic for the day ahead. Whether your students admit it or show it on their face, they may feel a bit stressed about diving back into a rushed morning at home again. Having something “relaxing” to do when they arrive at school will ease their stress, keep them busy, and allow them to feel successful in your classroom from the first minute they are back in class. 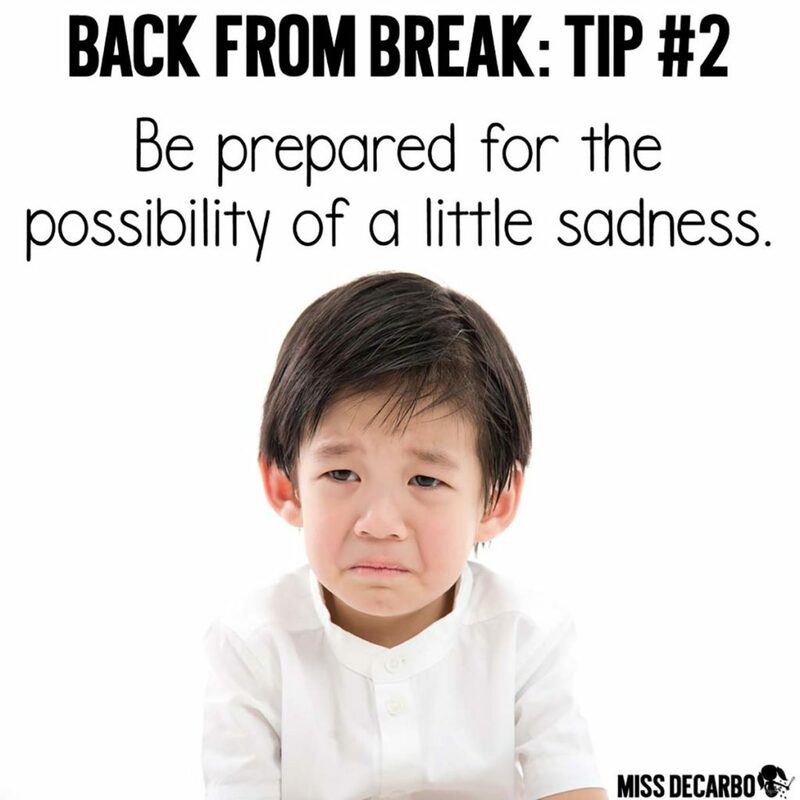 Whether you teach kindergarten or third grade, you MAY have one or two students who are filled with sadness during that first day back from break. Usually, I find that it happens when I’m not expecting it. I see a sad face as we are finishing up morning work. Or, I’m reading a book at the carpet and a little one is sadly staring down at the ground. Now that I have my own baby at home, I understand this more than ever before. Some of your kiddos got to spend their every waking hour during break with mommy, daddy, grandma, or another special family member. For students who struggled that first week of school, a long break can bring those feelings back and cause them to really miss home again. Simply being attentive and observant during your first day back can make all the difference to these students. Give them an extra hug on their way to lunch. Offer an extra warm smile as you pass out their math paper. Let them help you pass out materials, or erase the board to keep their minds extra busy. Just as it did in August, missing home will pass quickly. Most likely, by Day 2, they will be back into the swing of things and be fully immersed in your classroom routine again. Remember when I said your kiddos would be tired on their first day back from break? Well, unless you’re handing out Starbucks espresso drinks during your morning meeting (kidding! ), they might be a little sluggish all day. 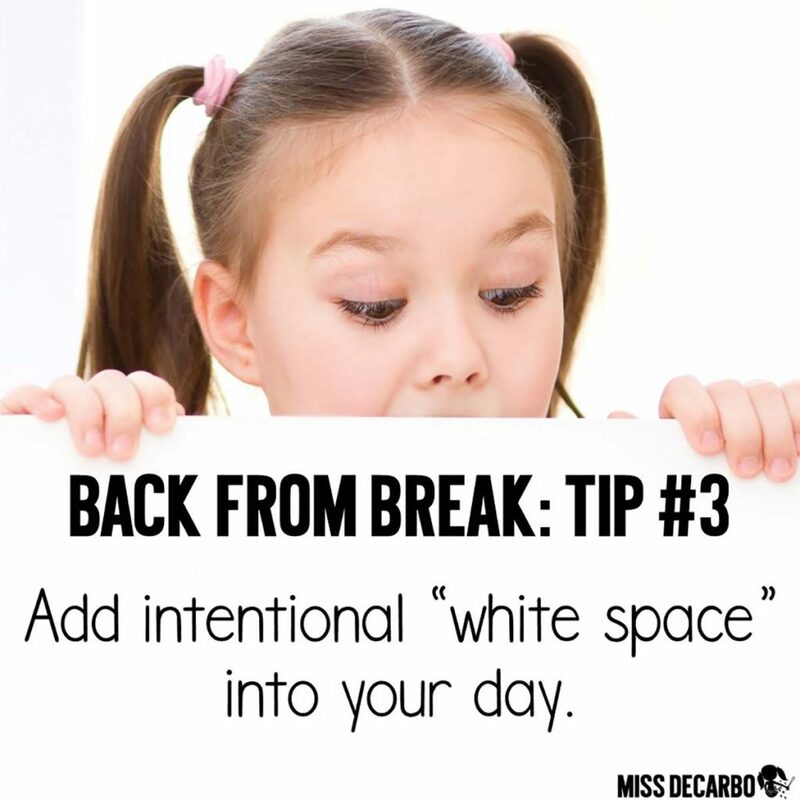 Plan for intentional white space in your lesson plans during that first day back. What is “white space” in your lesson plans? 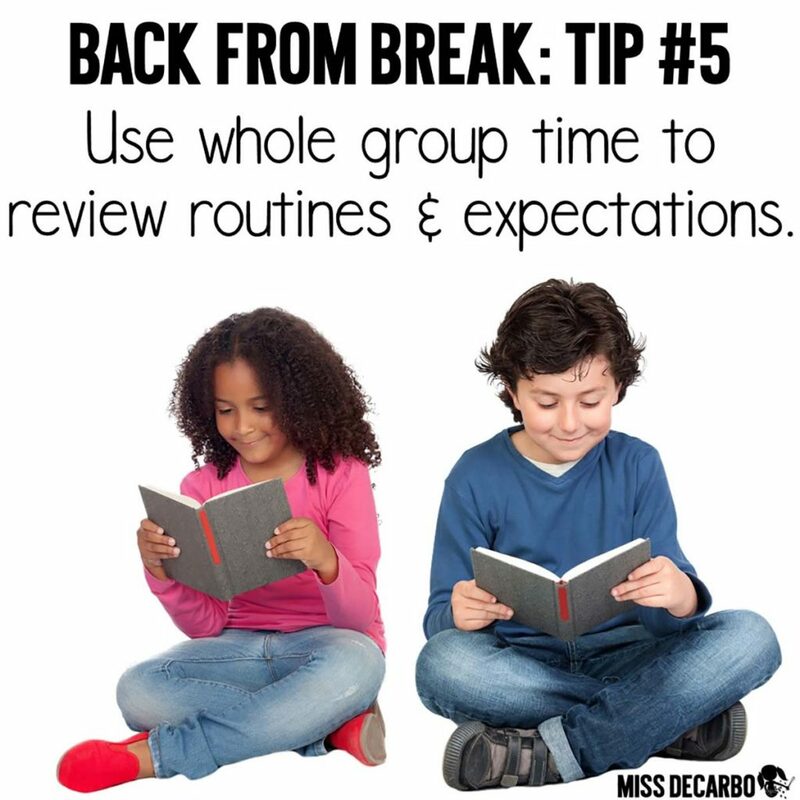 What I mean is, that first day back isn’t the day to try to squeeze in an extra round of Daily 5, or bombard your lowest small reading group with extra sight word instruction simply because it’s been awhile since you worked with them. I realize that as teachers, we come back as superhero teachers in January. We’re rested, and we’re ready to hit the ground running with interventions, RTI, and projects. Your students, however, may not move as fast as you that first day back. Plan on things taking a few extra minutes. 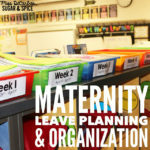 Plan on having to pass out a new monthly behavior calendar, or taking some time to teach students how to complete a new word work center or writing center. These things won’t take as long as they did during that very first week of school, but you may need a few extra minutes to ease back into the swing of things. Another area to intentionally add white space into is your whole group read aloud time. If you have any time during the day when you meet at the carpet, plan on your lesson taking a few minutes longer than usual. 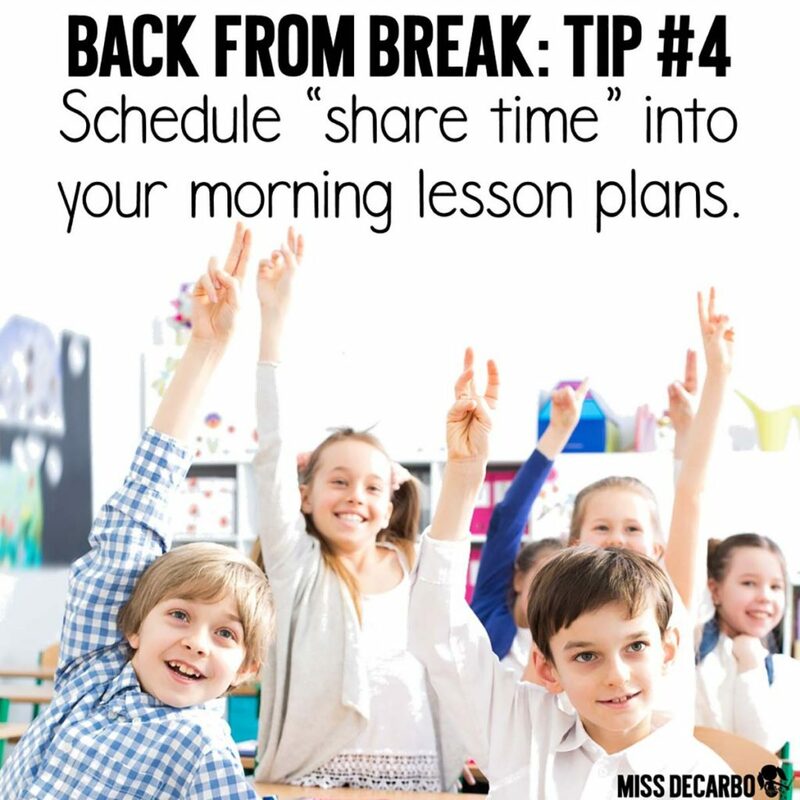 Most likely, your kids will want to share A LOT with you during that first day back. They have stories to share, memories to tell you about, and questions to ask you. You will feel a lot less stressed and frustrated about your lesson plan objectives if you build these extra discussion minutes into your plans. Students share a special moment with a friend or a small group of friends. Play music as students stroll around the room. When the music stops, students find a partner and have two minutes to chit chat about their winter break. When the music starts again, the students must disperse and continue to stroll around the room. They will have to find a new partner to chit chat with the next time the music stops. This last reminder is SO vital. Take your time and review your classroom rules and expectations with your students. Even if you THINK your students do not need the time to review your rules, I urge you to do it anyways. Even if your students seem calm and focused on that first day back, reviewing and practicing routines and procedures will never hurt your classroom culture. It can only help! I use the Daily 5 in my classroom for our literacy routines. On the first day back from break, I do NOT teach small group reading. Instead, we have a Daily 5 Boot Camp Day. What is a Daily 5 Boot Camp Day? It’s a day to revisit and reteach all of the routines, procedures, and stamina-building behaviors for each of our five choices: Read to Self, Read to Someone, Writing, Word Work, and Listen to Reading. Even though I have had years where I did not think my class needed a Boot Camp Day, I always, always, always plan and implement it anyways. I have found that reviewing healthy habits resets my students’ focus and motivation for the rest of the year. We make Daily 5 Boot Camp Day fun by being a little silly. After we practice our stamina as a way to review and reteach positive behaviors, we spread out and do some jumping jacks or push ups before we review more expectations. 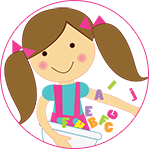 This keeps them laughing, moving, and learning! I hope you found this blog post to be a helpful, realistic look at various needs our students have to smoothly transition back to school after winter break. Remember, you know your students and your classroom better than anyone else ever will. These teacher tips may or may not work for your class or teaching philosophy. As for my own classroom and experience, I have found these five very simple reminders have helped us ease back into our very busy and structured daily classroom routine. 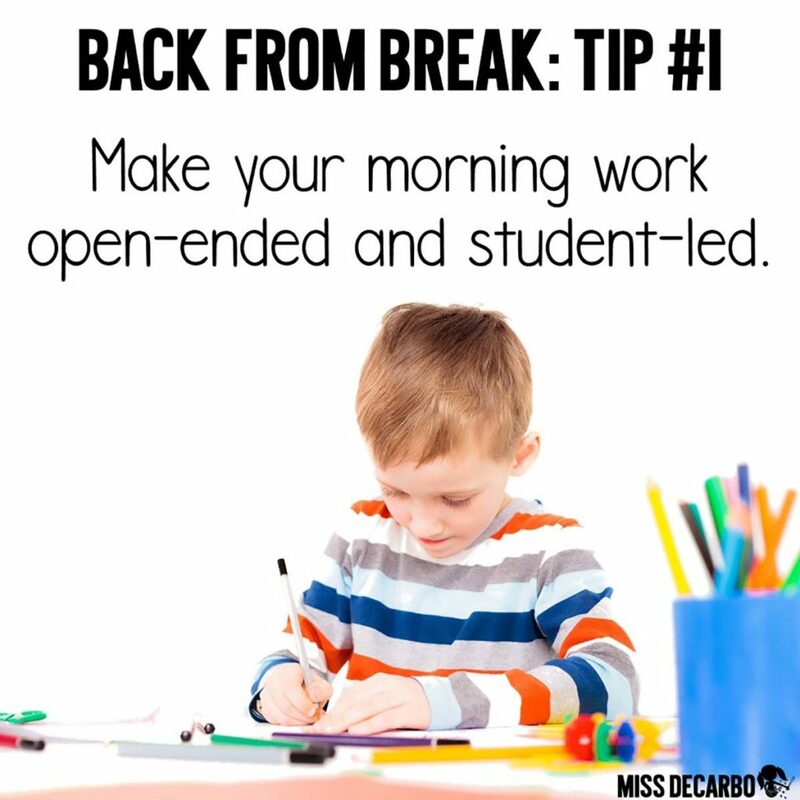 Keeping these teacher tips and reminders in the back of your head can help you have a happy, positive, and encouraging first day back from winter break! Thank you again for stopping by the blog. Please feel free to pin the image below to save it to your Pinterest page for future reference, or to share it with your teacher friends! Thank you so much! 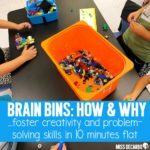 As a first year teacher these are extremely helpful and ease my mind about my little ones that first week. Thank you for the reminders and great ideas for the first day back-to-school! I especially like the idea where you play music, stop it, then have the students turn to the nearest partner and talk about things like where they may have gone over the holidays, favorite thing they did…. Thanks! Thank you for the reminder to slow down. Slowing down will pay off in the long term. I will take the time to review procedures and expectations. Thanks again. Great reminders for going back after break! Just FYI – the Twitter icon on your page links to Instagram as does the Instagram icon. Thank you so much Lisa for catching that! 🙂 I appreciate it! Thank you! I’m a first year teacher and was quite nervous to get started again since at the beginning of the year I failed to teach my routines and procedures how should have. Your post has reassured the plans I had to “hit the rest button” on my expectations and given me hope that it’s not too late. This was SUCH an informative and helpful post! Thank you so much for these tips!! Thank you Lisa. As a veteran teacher, it is still good to be reminded of revisiting routines and expectations. I also need to be kind to myself by not rushing into work but rather enjoy time with my kiddos. Relationships are at the heart of all learning. Enjoy your start-up! Thank you for the post! I see many of the same behaviors (even the sadness) in the middle grades as well. As a middle school teacher, I continuously review expectations with students so that there is never any “confusion” on their part. 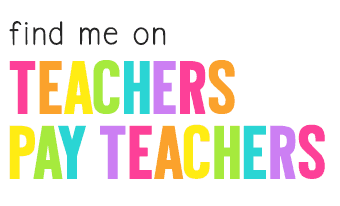 I will definitely share this post with my friends that are beginning their teaching career. Love your blog! Thanks for this awesome post! I’m a veteran of 10+ years in Kindergarten but these are great reminders for even me!! Well done!